When it comes to mascara my favorite brand to use is Rimmel London because their products always fall into the perfect price point for me. 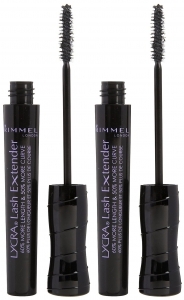 Rimmel London has a variety of mascaras on the market, and currently my favorite is the lycra lash extender. Another key must-have for me was to have mascara that would lengthen my lashes. I have pretty thick eyelashes, but they are not long and I wanted to have that extension element that would make my lashes appear even more beautiful. I made off with twenty of them just in case they were discontinuing the product. What I like about the mascara is that I don’t have to dip the brush multiple times to feel satisfied that I have enough mascara. All it takes is one dip and I’m done. I like how the black mascara really highlights my lashes and enlarges them as I brush them upward. flat ironing it. Your hair may appear short or medium length when it’s curly, but is long when it is straightened. The same results applied to my eyelashes. I felt that the mascara finally gave me a length that matched the thickness of lashes. is also easy to remove with some sort of makeup remover lotion or wipes. Overall, I’m completely satisfied with how well the Rimmel London lycra lash extender works for me. It makes my lashes appear longer which is what I wanted. It doesn’t clump up which I find highly unattractive in any mascara. For me, it doesn’t come off easily unless I use a makeup remover product which means I don’t have to do a lot of touch ups throughout the day. A great product at a great price.